Hands down the most exciting book I’ve read all year, Defiance takes the risk of not picking up immediately where it’s predecessor Heretic left off, and offers only small links to Heretic’s plot. The result, a story set in the same world but showing an entirely different angle, coupled with the strong female lead Heretic lacked, is spectacular. During Heretic I did stop to wonder what it must like to be on the ‘bad guys’ side of this world, and wondered who a consul could be and how someone might become one, or the people close to that person. I got the feeling that it was not as black and white as a consul and his guard simply being monsters or otherwise amoral people. 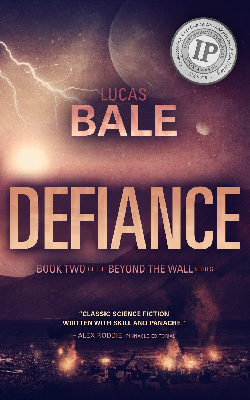 As soon as I got into Defiance my curiosity was quenched almost straight away – it’s a novel packed with questions about who the bad guys really are, with its questions and mystery creating a page turning quality that turns whole days into reading marathons. Just when I thought Lucas Bale’s economical, polished style could probably not be bettered, the author himself does just that, as the three interlocking 3rd person stories run frenetically from pace to pace yet at no point rely too heavily on plot or become bogged down in info dumping or science technicalities. The focus is always on the characters and their assessment of the human condition and why they do the things they do, despite being a hard science fiction story. The crossing of sci-fi with the horror genre is put to mesmerising use in this novel, with its second half going for the ‘What happened on this ship’ trope, and a generous helping of ‘What’s behind the door,’ all done with the kind of finesse that keeps a well used crossover of ideas fresh. So fresh in fact that putting this book down will leave lingering images for probably quite some time! Granted, there are times when a character’s train of though in action situations states the obvious to the reader, and there’s a fair bit of what I call ‘puzzling out loud’ that could occasionally be cut, but in most places I honestly couldn’t think of a way of avoiding this. The style of action building and fast problem solving is at least consistent throughout the whole book. To read Lucas Bale is truly to take a master class in getting modern sci-fi right, and it’s sure to entertain anyone even if they don’t ransack it for writing tips the way I will doubtless do as I go through my bookmarks. Perhaps better still, it would accessible reading even for those who have never picked up science fiction in their life. A challenge in places perhaps, but the best kind.